Next, the datatype for sorting the other columns is queried with the OnGetFormat event handler. 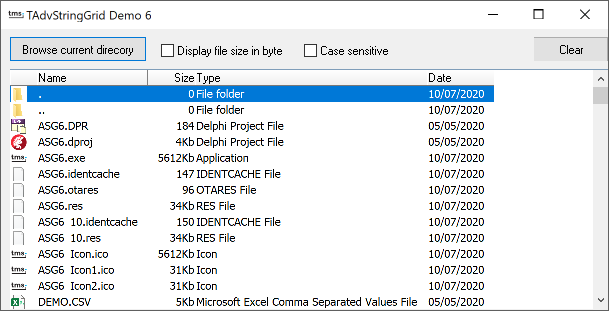 Column 1 and Column 3 can be sorted alphabetically (with and without case sensitivity) using the ssAlphabetic or ssAlphaNoCase sorting styles. For the second column, it can be choosen to display filesize in bytes or in mixed bytes/Kb style. When the filesize is displayed in bytes, the ssNumeric style can be choosen. When the filesize is displayed in mixed bytes/Kb size, the suffix parameter cannot be used here, since Kb means the numeric value must be multiplied by 1024. The prefix/suffix can be used for correctly sorting data like $1,$12,$120 or 1pk,12pk,120pk where prefix would be$ or suffix would be pk. But here in this case, there is no proper sorting style, so we must resort to the ssCustom style. How to do the custom sorting is implemented is discussed further. This is the OnGetFormat event handler, where a case structure is the easiest way to set formatting of all columns. When the ssCustom style is specified, the OnCustomCompare event handler is called with the cell data of the cells that it is comparing and here you must insert your own compare method. The result of the compare is specified in the res parameter and is 1 of str1>str2, -1 when str1<str2 and 0 when str1=str2. In this event handler, code is written to check for the Kb suffix and multiply by 1024 if so.